The Striker 7.1 supports S/PDIF input monitoring to the front analog output. 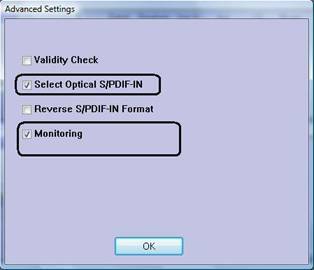 The following steps outline the procedure for monitoring the S/PDIF signal sent to an external digital device. 1. 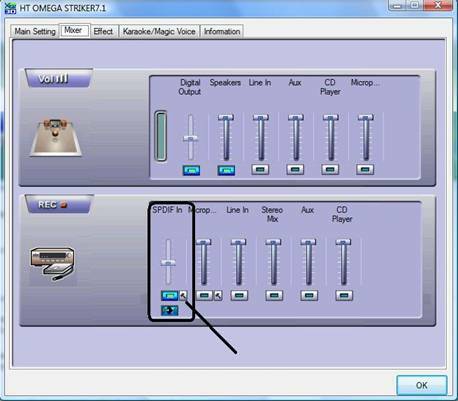 >Mixer Tab > Select S/PDIF Input as pictured and select the advanced option. 2. Check "Select Optical S/PDIF - IN" and also select "Monitoring"
Note: For digital coaxial monitoring, do not check "Select Optical S/PDIF-IN"
Note: The S/PDIF input monitoring feature only supports PCM (stereo) data input from an external digital device. So please set your device (receiver, gaming console, etc.) to output PCM. The monitoring feature does not provide Dolby Digital or DTS signal decoding.